During this week, I’m going to be taking you guys through a tour of some of the various wheelguns I own. 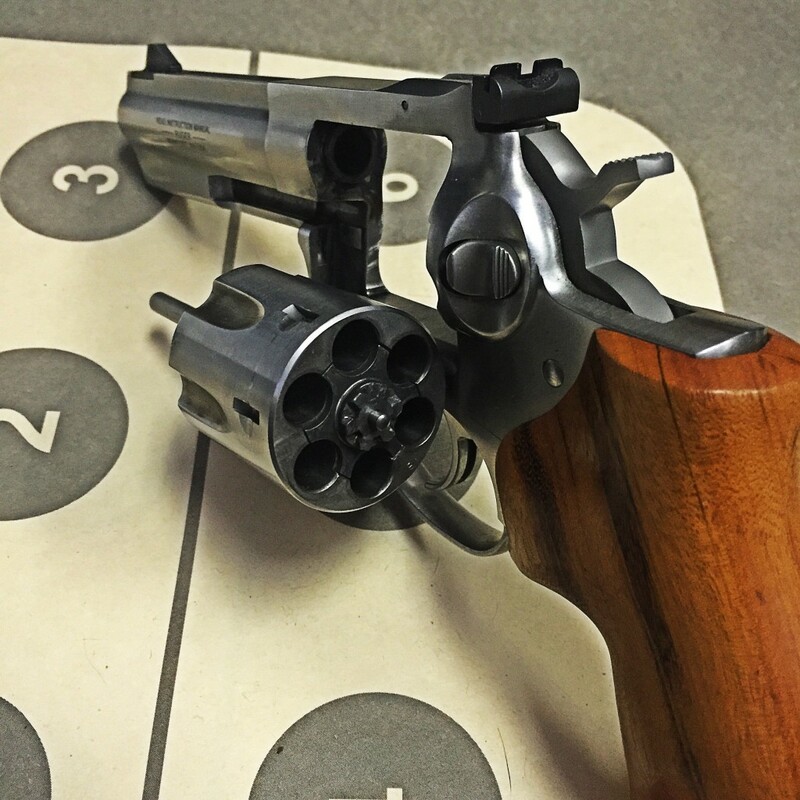 This started from a photo I posted on my fan page, which turned into a short post here on Gun Nuts simply titled “I like wheelguns.” We’ll start this series of posts with one of the guns that I’m most often associated with, the Ruger GP100. I’ve had this particular GP100 for 3 years now. It went to the 2012 and 2013 IDPA Nationals, and the 2013 Indoor Nationals as well. It was only recently replaced as a main match gun by the new GP100 Match Champion, which I feel handles a little bit better for IDPA purposes. That’s not a knock on the standard GP100. No joke, if I had to go into the plains of South Dakota and could only take one handgun, this would be the one I’d grab. I prefer the adjustable sights, so I can sight the gun in for different bullet weights and loads. Of my GP100s, this one had the best trigger by far, with a DA pull around 7-8 pounds. The SA pull is great as well, 2.5 pounds. The only downside to these great trigger pulls is that the gun is a little primer sensitive. I need to make sure I stick to Federal primers to ensure reliable ignition, which isn’t really that much of a hardship. In the GP100 lineup, I think that the 4.2 inch barrel guns are the best in terms of overall handling and shootability. 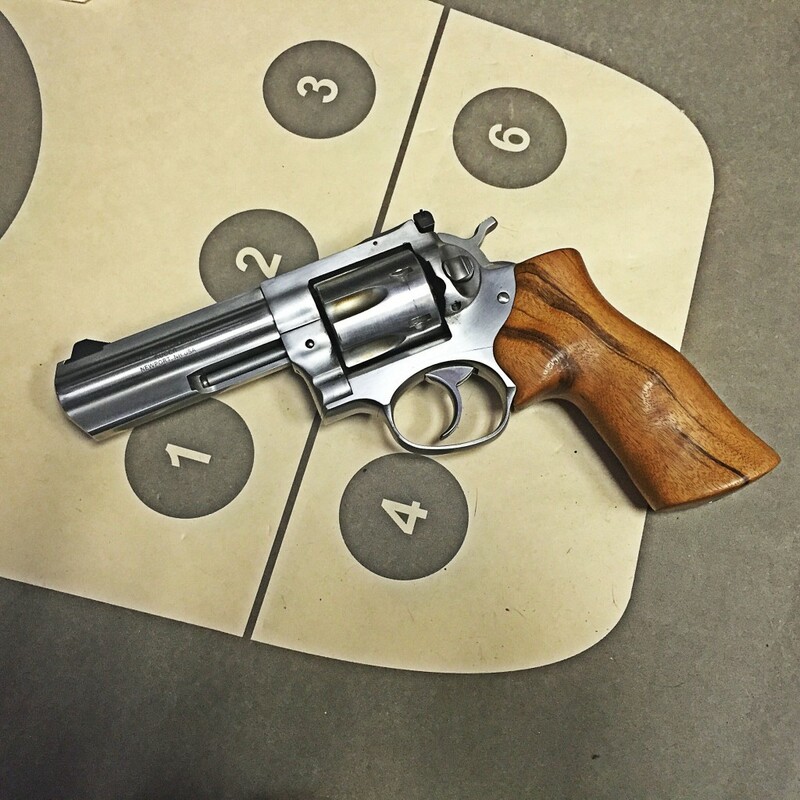 The six inch guns are too muzzle heavy, and while they’re great for heavy magnum loads, I’ve always felt that if I’m going to pack a six inch revolver that size, I might as well upgrade the caliber to something that starts with the number 4. But the 4 inch GP100 is just right. It’s heavy enough that shooting magnums isn’t really bothersome, but it’s also a gun that you can carry on a regular basis without getting exhausted by it. The factory sights are good, and like most Ruger revolvers it’s overbuilt as a matter of principle. It takes a lot of rounds and a lot of abuse to put this gun out of action. This particular GP100 was my main IDPA match gun for two years, and since retiring from that role served as my primary test bed for most .38 and .357 ammo. When it was my main match gun I logged about 7500 rounds on it, and since then I’ve probably put another couple thousand on it. I recommend this revolver all the time when people ask “what’s a good 4 inch general purpose revolver?” The Ruger GP100: it’s hard to go wrong with one of these. What does the future hold for this gun? Well, since you asked, I’m sort of toying with the idea of sending it to Gemini Custom for their Ultimate 3 inch Conversion package. But we’ll see. So what is your favorite holster(s) for competition and concealed carry for the 4.2. I know you’ve talked about various ones like the Blade-Tec, Garret Industries, Galco, etc… But what is your current top choice. I’m plan on shooting IDPA with mine this year. I carry a SP101 on a daily basis, but I’m really starting to think about going with the GP100. I’m one of those weird people who likes to carry what I compete with. For strictly competition, the Garrett Industries OWB belt holster is my personal favorite for competition. For carry, it’s a Galco leather IWB all the way. Those two holsters solve 99% of my carry problems so long as I’m smart about how I dress. I only own one revolver, but I love shooting them. I have a hard time with wood grips, even textured ones. These wood grips seem like they would be a bit harder to control. Are they slick? Although training with them obviously is the key, do you just rely on hand strength when shooting in matches. Do you use textured gloves? Any other considerations when shooting for accuracy and speed? With these grips, I absolutely have to rely on grip strength to control the gun. I would like them with a little more checkering, for example the grips on the Match Champion GP100s are nearly perfect wood stocks. The GP 100 was my first revolver, and I regret having sold it. It was 100% reliable and would handle all ammo/primer combos including Wolf primers. As they say “it takes a lickin’, and keeps on tick in’.” Since I sold the Ruger I have been shooting a Smith and Wesson M66 in IDPA, and I must say it is also a fine wheelie. I would have a difficult time choosing between the two, so I would probably want both.